1950's vintage mid century era earrings. Faux pearls, rhinestones & brass. 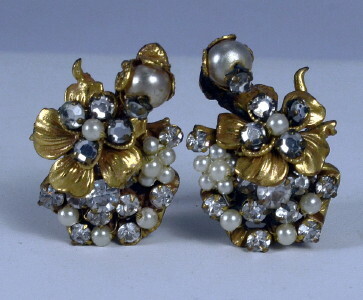 Brass flower applied over with rhinestone flower and clustered wired tiny pearls & rhinestones. Brass flower topped with larger pearl & rhinestone. Marked ROBERT on clip backs. All original mid century era, true 1950's vintage.